If you've opened or expanded a retail store in recent years, you know not selling online has (probably) never been an option. While e-commerce provides access to much larger markets, it also complicates even the simplest of retail operations, and one of the hardest things to do is figure out which sales taxes apply. Here's an overview of when you should collect sales tax and how to keep track of everything. When Do You Charge Your Own State's Sales Tax? You generally collect your state's sales tax on orders placed from within or delivered to your own state. In most states, you should not collect local sales tax on out-of-state orders. If your out-of-state buyer places an order using their computer at home for delivery to another state, you do not collect your local sales tax. Many states have both a statewide sales tax and a local city or county sales taxes. You must collect all applicable taxes, and you should generally collect the sales tax rate that applies at the location of the sale. California follows this rule. When Do You Charge Another State's Sales Tax? You typically only collect sales tax for another state when you have a physical presence in that state. In legal terms, this is known as the nexus test. A physical presence can include a retail store, warehouse or corporate office, even if the facility is not open to the public. In some states, entering into an affiliate agreement with a resident of the state may also establish a physical presence in that state. 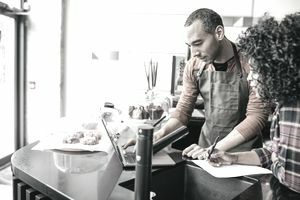 If you do business at your customer's locations, you should check with your tax advisor as to whether traveling to a state and conducting business would cause the state's sales tax rules to trigger. How Do You Determine the Location of an Online Sale? A retail transaction that takes place entirely online is usually taxed by the shipping address. States presume that online orders are physically placed from the shipping address with the intent to use the item at the shipping address. Make sure that specific states you do business in agree with this just in case some vary from billing versus shipping addresses. How Do You Keep Track of the Different Tax Rates? You are responsible for collecting the correct and current sales tax rate on all sales that require you to collect sales tax. With different rates in each state, county and city, the sales tax rate may change at virtually any time. Each state usually has an online database with current sales tax rates. Most e-commerce platforms look up the customer's address automatically and charge the applicable tax rate. You are only responsible for selecting the jurisdictions for which you need to collect sales taxes. Utilize synchronized systems and make sure that your technology providers update sales tax rates in real-time to ensure your tax rates remain compliant. With current accounting technology, it is actually easier to leverage systems than even the most seasoned professionals to make sure you are current with your rates. What Do You Do With the Sales Tax You Collect? You must send the sales taxes that you withhold to the appropriate state. Many states, such as Michigan, require you to submit monthly sales tax returns. Since you are collecting the tax directly from the customer, you do not consider it as part of your income. Failing to pay the correct amount in full and on time is a much more serious offense than being late with your income taxes, and it could lead to losing the right to do business within the state as well as hefty fines. Use a professional accountant, CPA, bookkeeper or outsourced accounting services to track sales taxes collected accurately, keep the funds in separate accounts, and set up automatic sales tax payments to each state.